Raoul Bott (September 24, 1923 – December 20, 2005) was a Hungarian-American mathematician known for numerous basic contributions to geometry in its broad sense. He is best known for his Bott periodicity theorem, the Morse–Bott functions which he used in this context, and the Borel–Bott–Weil theorem. With Richard Duffin at Carnegie Mellon, Bott studied existence of electronic filters corresponding to given positive-real functions. In 1949 they proved a fundamental theorem of filter synthesis. Duffin and Bott extended earlier work by Otto Brune that requisite functions of complex frequency s could be realized by a passive network of inductors and capacitors. The proof, relying on induction on the sum of the degrees of the polynomials in the numerator and denominator of the rational function, was published in Journal of Applied Physics, volume 20, page 816. In his 2000 interview with Allyn Jackson of the American Mathematical Society, he explained that he sees "networks as discrete versions of harmonic theory", so his experience with network synthesis and electronic filter topology introduced him to algebraic topology. Bott met Arnold S. Shapiro at the IAS and they worked together. He studied the homotopy theory of Lie groups, using methods from Morse theory, leading to the Bott periodicity theorem (1957). In the course of this work, he introduced Morse–Bott functions, an important generalization of Morse functions. This led to his role as collaborator over many years with Michael Atiyah, initially via the part played by periodicity in K-theory. 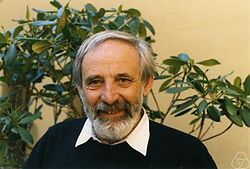 Bott made important contributions towards the index theorem, especially in formulating related fixed-point theorems, in particular the so-called 'Woods Hole fixed-point theorem', a combination of the Riemann–Roch theorem and Lefschetz fixed-point theorem (it is named after Woods Hole, Massachusetts, the site of a conference at which collective discussion formulated it). The major Atiyah–Bott papers on what is now the Atiyah–Bott fixed-point theorem were written in the years up to 1968; they collaborated further in recovering in contemporary language Ivan Petrovsky on Petrovsky lacunas of hyperbolic partial differential equations, prompted by Lars Gårding. In the 1980s, Atiyah and Bott investigated gauge theory, using the Yang–Mills equations on a Riemann surface to obtain topological information about the moduli spaces of stable bundles on Riemann surfaces. In 1983 he spoke to the Canadian Mathematical Society in a talk he called "A topologist marvels at Physics". Bott had 35 Ph.D. students, including Stephen Smale, Lawrence Conlon, Daniel Quillen, Peter Landweber, Robert MacPherson, Robert W. Brooks, Robin Forman, András Szenes, and Kevin Corlette. ^ Atiyah, Michael (2007). "Raoul Harry Bott. 24 September 1923 -- 20 December 2005: Elected ForMemRS 2005". Biographical Memoirs of Fellows of the Royal Society. 53: 63. doi:10.1098/rsbm.2007.0006. ^ McMurray, Emily J.; Kosek, Jane Kelly; Valade, Roger M. (1 January 1995). Notable Twentieth-century Scientists: A-E. Gale Research. Retrieved 28 October 2016 – via Google Books. ^ "Bott biography". Retrieved 28 October 2016. ^ "Community of Scholars". ias.edu. Institute for Advanced Study. Archived from the original on 2013-03-10. Retrieved 4 April 2018. ^ Jackson, Allyn, "Interview with Raoul Bott", Notices of the American Mathematical Society 48 (2001), no. 4, 374–382. ^ R. Bott (1985). "On some recent interactions between mathematics and physics". Canadian Mathematical Bulletin. 28 (2): 129–164. doi:10.4153/CMB-1985-016-3. ^ "The President's National Medal of Science: Recipient Details - NSF - National Science Foundation". Retrieved 28 October 2016. ^ "Raoul Bott - The Mathematics Genealogy Project". Retrieved 28 October 2016. ^ Stasheff, James D. (1984). "Review: Differential forms in algebraic topology, by Raoul Bott and Loring W. Tu". Bulletin of the American Mathematical Society (N.S.). 10 (1): 117–121.